If I could fly, I would be in Las Vegas attending the Consumer Electronics Show 2008. All new sparkling, mini, ultra gadgets are there. Bloggers who attended the event got to touch and see face to face uber gizmos that are yet to be released. Fortunately, the internet makes it possible for us here to also take a glimpse of what's in store for us this year. photo from Ubergizmo. 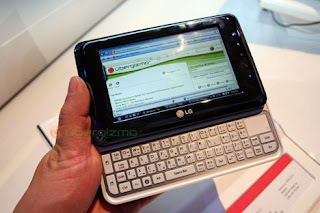 I have my eyes on this LG UMPC, i hope to see you soon! I predict it's the year of UMPCs or Ultra Mobile Pocket PCs. Asus Eee PC came over to Philippines late last year but in 2008, UMPCs will make their way to Asia too. UMPCs can be considered as an alternative to ultra portable laptops like Eee PC, although it may be more expensive. Unlike previous models of pocket PCs, UMPC's have more practical QWERTY keyboards, touch screens, and bigger memory capabilities of up to 40 GB (maybe some are still expandable). Their LCD screens are also wider and crispier in color.